Today’s lesson in “don’t read the comments” – Shawna Malvini Redden, Ph.D. 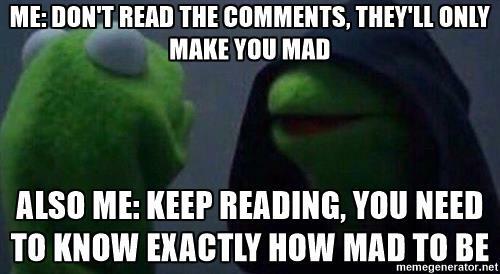 I always read the comments. Obviously. I’m a qualitative researcher. The comments are where evaluations come alive. Except this week on Rate My Professor, apparently. Heading into my 10th year of teaching (wow), I received my first “poor” rating. WHY did I even click the link? I’m stumbling around in my typical early August, don’t-want-to-face-the-reality-of-the-upcoming-semester, malaise. I’m supposed to be revising an article and crafting a new syllabus, not poking around on stupid websites. I’ve already mentally debunked the review, too. Level of difficulty a 1?? Puh-lease. My most consistent evaluation is as a tough grader. The class is described as an “Easy A” even though the student reported earning a B. Okay. I think there were two As in the entire class. And I take the “students create the syllabus and pretty much teach themselves” critique as a compliment, thankyouverymuch. YEP. That’s the whole point of my teaching style, especially at the senior level. Students are actively involved in their learning. But of course, I’m stewing. And ignoring the previous positive comments. And questioning my methods. Someone found my syllabus negotiation–the one I thought was so exciting and thought-provoking–elementary? Bah. In five minutes, when I’ve finished this small rant, I’ll get re-focused. The formal course evaluations were glowing. Students described the negotiation as a favorite part of the class. I will not fixate on this one piece of negative feedback (for very much longer). But I won’t forget it either. And I hate that. In the last near-decade, I’ve read through probably a thousand student comments–lots of glowing praise (#notsohumblebrag), lots of complaining about the difficulty of exams, lots of thoughtful suggestions. But what do I remember most? The means ones. Like that one person who complained about the way I hold my face when I answer questions. Apparently I shouldn’t scrunch it up and shrug when I don’t know the answer, I should SMILE more. I hate that the negative and petty sticks so well in my memory.